New York City is in the midst of an affordability crisis which poses an existential threat to the city’s characteristic vitality and diversity. Even during a time of rapid development in the affordable housing sector, many New Yorkers are being priced out the city and many more are struggling to pay the rent. Are existing plans to address the issue adequate, or is it time to consider more radical approaches? What are some big ideas for making New York housing more affordable? Hear five distinct proposals -- as diverse as the city itself -- from thought-leaders and activists trying to reframe our current approach to housing. A discussion moderated by The Atlantic's CityLab journalist Kriston Capps will follow. Please note that William Spisak is no longer able to participate in this event. This program is co-presented by CityLab, the urban-focused site of The Atlantic. This is the second event in our new series, Housing Tomorrow's City, which explores the challenges and opportunities presented in the Museum's Future City Lab, the interactive third gallery in the New York at Its Core exhibition. To view all of the programs in the series, click here. Deyanira Del Río, Co-director of the New Economy Project. Their mission is to build an economy that works for all, based on cooperation, equity, social and racial justice, and ecological sustainability. Del Río is also the board chair of the LES People’s Federal Credit Union and the NYC Community Land Initiative. Monique “Mo” George, Executive Director of Picture The Homeless (PTH). PTH's numerous victories include passing legislation for the Housing Not Warehousing act that will remove thousands of units from being warehoused by landlords and placed back in to active units. She was recently recognized as one of City & State NY's Brooklyn Power 50. Rosanne Haggerty, President and Chief Executive Officer of Community Solutions. Community Solutions was launched in 2011 to help communities solve the programs that create and sustain homelessness. Haggerty is a MacArthur Foundation Fellow, Ashoka Senior Fellow, and Hunt Alternative Fund Prime Mover. Howard Husock, Vice President for Research and Publications at the Manhattan Institute. Husock is also director of the Institute’s social entrepreneurship initiative and a City Journal contributing editor. He is the author of Philanthropy Under Fire (2013) and The Trillion-Dollar Housing Mistake: The Failure of American Housing Policy (2003). Kriston Capps (moderator) is a staff writer for CityLab, the urban-focused site of The Atlantic, covering housing, architecture, and politics. He previously worked as a senior editor for Architect magazine. $25 Adults | $20 Students, Seniors, and Educators (with ID) | $15 Museum Members. Ticket includes same-day Museum admission. This program is part of our Housing Tomorrow’s City program series, inspired by our Future City Lab, the third gallery of our award-winning exhibition New York at Its Core. The series is presented in memory of Future City Lab curator Hilary Ballon. Housing Tomorrow’s City is made possible in part by Sophia and Peter J. Volandes. 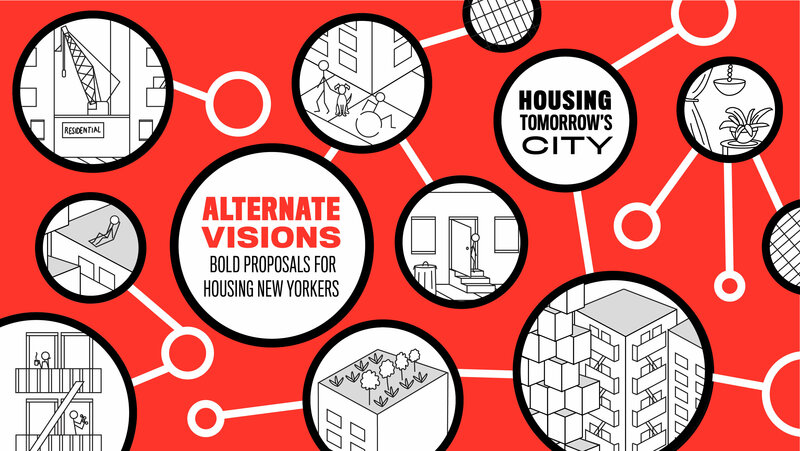 "Alternate Visions: Bold Proposals for Housing New Yorkers" is co-presented by CityLab.